Welcome to Canada’s Largest Leather Store! Celebrating over 50 years of fashion expertise! Just off Highway # 4, nestled amid the picturesque beauty of the countryside, is Southwestern Ontario’s most surreal shopping experience....The Old Mill. The Old Mill designs products from our own tanneries such as leather jackets, wool blankets and wool work socks. Our tanneries are famous for creating the washable sheepskin rug (the first in North America). Because of our tanneries we are rich with history and expertise in leather and wool. The Old Mill has a large selection of Canadian made products including luxurious leather jackets made from our own tanneries. We also carry a huge assortment of mohair throws and sweaters imported from Scotland and Ireland; and world-class fashions, sportswear, activewear and accessories from New York, Paris and Montreal... NYDJ, Mavi, Yoga Jeans, Gitane, Bench, Desigual to name only a few!! We have hundreds of jacket styles for you to choose from in all size ranges, XS to 4XL tall! 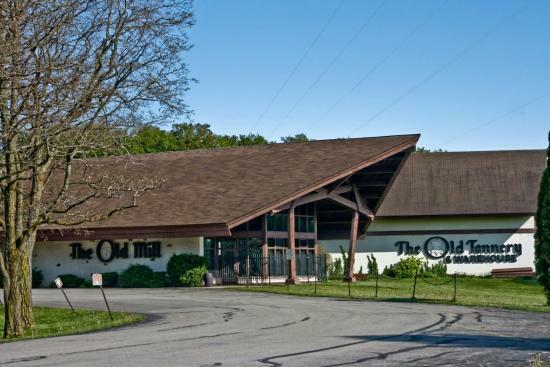 Come and shop for the whole family and experience The Old Mill, a true shopping experience!